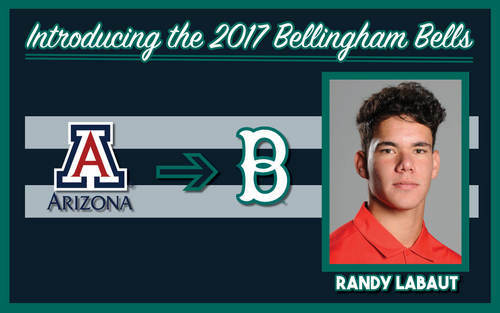 The Bellingham Bells have added another Pac-12 talent to the 2017 roster, announcing today that Arizona’s Randy Labaut will join the Bells in the summer of 2017. Labaut, a two-way player who has seen time on the mound and at the plate for the Wildcats, will primarily play the infield for the Bells this summer. Labaut is in his redshirt freshman campaign with U of A, where the Downey, Calif. native has appeared in 13 games on the mound and four contests at the dish, hitting .400 with 2 RBIs as a batter and tossing 29.2 innings on the hill, going 1-2 with a 4.60 ERA, striking out 21 as a pitcher. After redshirting last season, Labaut played for the Lacrosse Loggers of the Northwoods League in the summer of 2016. With Lacrosse (WI), Labaut saw 61 at bats, reaching on base at over a .300 clip, scoring nine runs and driving in four runs. Prior to arriving in Tuscon, Labaut was a talented prep pitcher at Downey HS, finishing his career with 19 wins, a 2.05 ERA and 209 strikeouts in 180.2 innings on the bump. Following his senior season with the Vikings, the 6-1 lefty was drafted in the 37th round of the 2015 MLB Amateur Draft by the Toronto Blue Jays. Bellingham is slated to have players from 9 of the 11 schools that play baseball in the Pac-12 conference, including both Arizona programs (Arizona and Arizona State), both Washington teams (Washington and Washington State) and Top 5 program Oregon State. Labaut and the 2017 Bells will look to begin another successful campaign on Friday June 2nd against the Gresham GreyWolves at Joe Martin Field. The Bellingham Bells are a summer, wood bat, collegiate baseball team that plays in the West Coast League (www.westcoastleague.com). The Bells play their home games at Joe Martin Field in Bellingham and their field staff includes Greg Goetz (Head Coach), Jim Clem (Assistant Coach/Pitching), Jake Whisler (Assistant Coach) and Rick Teegarden (Assistant Coach). Former Bells players who have spent time in Major League Baseball include: Jeff Francis (Colorado Rockies), Kevin Richardson (Texas Rangers), Ty Taubenheim (Toronto Blue Jays) and Marc Rzepczynski (Seattle Mariners).